When we decided at CTG to have a Daredevil celebration leading up to the new, original Netflix series I knew immediately what arc I wanted to cover, Born Again! I only first read this tale about 5 years ago but upon closing the back cover it not only became my favorite Frank Miller story but also one of my favorite stories period. I’m a huge fan of writer Frank Miller’s work but for whatever reason I was extremely late to the party on this one. I’ve made up for it since with reading it at least once a year. The really weird part of my love for this 8 issue series is I’m not a fan of a certain element presented in the last 2 issues! I know this sounds extremely strange to basically not like a quarter of the series but still profess my love for it but I’ll explain all that later. First let’s talk about how great this run is! The arc is brought to us by the creative team of the aforementioned writer Frank Miller along with David Mazzucchelli handling the art duties. They had both received critical acclaim on the title before separately but Born Again plus the issue before would be the first time they created magic together. They of course would go on the following year to create one of the most talked about Batman adventures of all time, Year One. 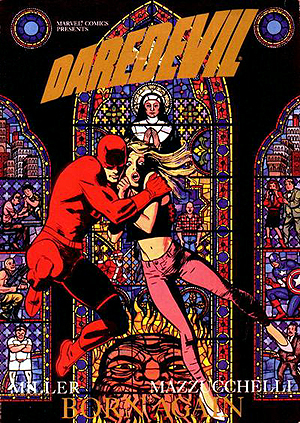 This is without a doubt one of the finest if not the best Daredevil story ever told. It opens with Karen Page, our hero’s former lover, selling Daredevil’s secret identity for a heroin fix. The information quickly makes its way to the Kingpin who sets into a motion a chain of events to destroy the man behind cowl, Matt Murdock. In all my years reading comics I’ve never come across such a chilling portrayal of the Kingpin. He is at his most frightening and merciless in these pages. The pain and suffering he puts Matt through by relentlessly taking away everything and everyone he holds dear is downright terrifying! He begins by destroying his finances, career, and material possessions. He then moves on to turning all Matt’s allies and friends against him. The psychological damage inflicted by this nearly devastates Matt’s mind. He is alone with questionable sanity living on the street. 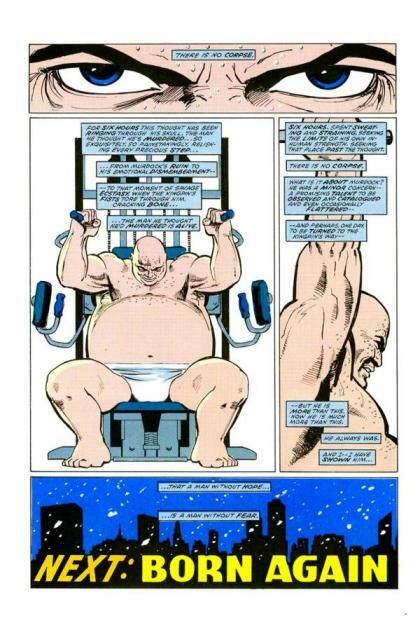 Then and only then does Kingpin decide that enough is enough and Matt must die! The Kingpin seems unstoppable and frankly the epitome of evil. Despite all the torture Matt endures throughout this journey he somehow manages to rise above it and come out as our noble hero. We witness his betrayal, his abandonment, his defeat and downfall. He’s really at his darkest hour with everyone against him but somehow, someway he finds a way to survive. Even at his lowest point he finds the courage and selflessness to be a hero because the world that gave up on him now needs him. For the most part I thoroughly enjoy the supportive cast in this series. They are really well written and add necessary roles to the development and pace of the story. I particularly like the Karen Page character as well as the shady drug dealers she has associated with her. Her betrayal of Daredevil is obviously the catalyst for the story but the sub story of her trying to redeem herself throughout the tale is a compelling on its own. Her addiction battle adds another layer of grittiness to the series as she desperately tries to find Matt and shake her demons. The despair and misery she finds herself surrounded by really brings another sense of hopelessness to the reader. The character I did not enjoy and found downright jarring to the series was the American super soldier, Nuke. I found he was out of place and didn’t fit with the overall ambience of the story. I understand that Miller was portraying him as potentially the final straw to break Matt’s spirit and challenge his morality by having Nuke commit mass killings and destroy Matt’s neighborhood. That even through that our hero rises above and does everything in his power to save Nuke’s life thus completing his rise from gutter back to iconic hero. Even though I get this I still find his presence is out of place. I think they also wanted to portray just how powerful the Kingpin was by being able to acquire such a weapon through blackmail but I really think the story could’ve done without him. Like I said in the beginning I still love this story but after each re-read I find this part harder and harder to get through. The great parts of this series are so great I still rank this as some of the finest storytelling even with the flaws I perceive. I can’t imagine a more perfect artist to compliment Miller’s story than David Mazzucchelli. I think Frank says it best in the afterword of the collected edition of Born Again: “It’s almost criminal how easy David makes it to write a script. He makes a three-dimensional stage of the individual panel, complete in authentic detail, nonetheless uncluttered and utterly readable. He creates actors whose dramatic range is startling, whose best and most compelling moments are wordless.”. The panel work throughout this series is amazing. It makes for perfect pacing and leaves you wanted to turn the page as fast as you can to see what could possibly happen next. Before reading Frank’s quote I didn’t particularly notice the details in the panels. I think because of the fast-pace of the read so I went back and looked. It’s amazing what he pack in there without making it look cluttered and still leaving adequate space for dialogue and narrative balloons. 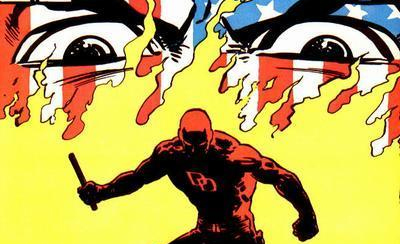 This is one of the finest comic book arcs of all time and will always be my personal favorite Daredevil story. It is always my first suggestion to people who either are looking for a mature superhero story or a story to see what exactly Daredevil is all about. I’m sure I read this quote somewhere but I think it describes the arc best so I’m stealing it, “a man without hope is a man without fear”! We have hundreds involving marketers total about free fifa 16 coins at the same time could for example on crack out the xbox 360 community codes as no cost. Looking foreword for more information and this subject has constantly interested me. Thank you for composing an article that has awesome substance and is elegantly composed and even I am inspired by your written style too. You can take this munnar call taxi for any tours and travels program of your family. They are providing secured and comfortable cabs. This is very good posting. A lot of Information provides us. Really fascinatin story that my generation definitely watched and read. Something to keep us reminded about the world, the reality and how we can go about with it, just like the comic stories posted at Sleekwriters.org which are very entertaining. I have habit of reading comic books from my childhood as I have being a home tutoring student where I did my schooling by studying from house only. These books have become my world in my free time or I use to download those from homework help au blog which use to have very good collection of comics books in their database.